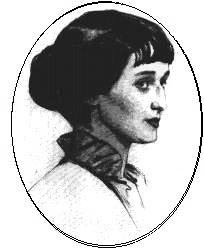 Anna Akhmatova is the literary pseudonym of Anna Andreevna Gorenko. Her first husband was Gumilev, and she too became one of the leading Acmeist poets. Her second book of poems, Beads (1914), brought her fame. Her earlier manner, intimate and colloquial, gradually gave way to a more classical severity, apparent in her volumes The Whte Flock (1917) and Anno Domini MCMXXI (1922). The growing distaste which the personal and religious elements in her poetry aroused in Soviet officialdom forced her thereafter into long periiods of silence; and the poetic masterpieces of her later years, A Poem without a Hero and Requiem, were published abroad. "And Now, I Am Ready To..."
"And You My Dear Friends..."
"If I Do Not See You..."
"If the Moon On the Skies..."
"I Was Born In a Right Time..."
"Oh, Lord, I Can Forgive..."
"One Goes In Straightforward Ways"
"Our So Holly and Beautiful Craft..."
"There's None Equal to Me..."
"To Sleep In Deep Sadness..."
"When They Are Burying the Century..."
"Why Is This Century Worse..."
"You'll Live, But I'll Not..."